Who says we can’t be friends? This just in: Foreigner to Play All American Summer Concert Series on Fox & Friends on 6/14! 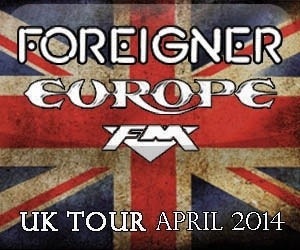 Foreigner will perform for the All American Concert Series on Fox & Friends on Friday, June 14, 2013! The concert series takes place on Friday mornings and is broadcast live at 1211 Avenue of the Americas in New York City on the corner of 48th St. and 6th Ave. Local Fans are encouraged to join us from 7 – 9 AM ET for free music and free Famous Dave’s BBQ! Be sure to tune in to the live broadcast and get your morning off to a rockin’ start! With the 2013 Induction Ceremony & Awards Presentation for the Songwriter’s Hall of Fame for Mick around the corner (Thursday, June 13th), it will be a busy week in NYC. After Fox & Friends, Foreigner heads to Citi Field later that evening for a live show following the Cubs vs. Mets game. We just Can’t Slow Down!